Abdullahi stood on a chair and raised a helmet high above his head as the other kids counted down. 5…4…3… Even before the group finished counting, the helmet hit the ground…hard. I had my doubts about whether the egg that Abdullahi and his two buddies had carefully wrapped in shop rags and inner tubes survived the fall. But as I slowly unwrapped the bundle, there it was, still intact. The group erupted in cheers and applause. 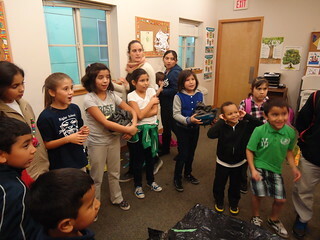 This fall, children ages 6- 12 who are enrolled in Expresiones, Hacienda’s after-school program, participated in a series of bike safety workshops taught by members of Andando en Bicicletas en Cully (ABC), Hacienda’s bike committee. 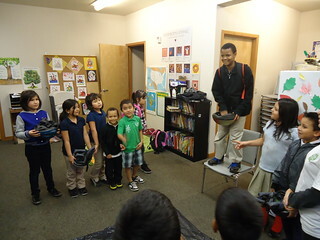 ABC members worked in pairs to deliver workshops about helmet safety and flat tire repair at three locations in the Cully neighborhood. While some of the kids are former Holiday Bike Drive participants, many come to the workshop without prior experience with bike safety. Through activities like the Helmet Egg Drop – a clear favorite – new participants learn about the importance of wearing a helmet while riding a bike. For former Holiday Bike Drive recipients, these workshops reinforce some of the lessons from the event. While working with a new age group is challenging, ABC is looking forward to leading bike rides for kids next year. In the spring, ABC members will participate in ride leader training and will get the chance to lead a series of rides during the summer. For kids like Abdullahi, it’ll give them the opportunity to practice what they learned in a workshop on the road.